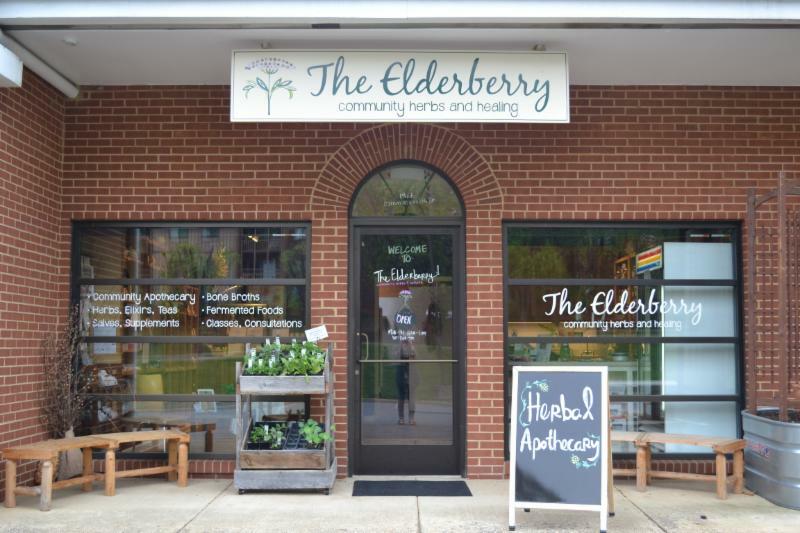 Located at 1917 Commonwealth Drive in Charlottesville VA, The Elderberry Community Herbs & Healing, is an herbal apothecary specializing in custom tea and tincture preparations for people practicing herbal medicine. The golden chimes hanging on the front door greets you, the cheery sound offering warmth and welcome to all who enter. The fragrant aromas of fresh herbs, tea, and bone broth brewing in the kitchen mingle together. The kitchen is a gleaming example of what a VDACS (Virginia Department of Agriculture and Consumer Services) kitchen ought to look like, impeccable to even the keenest of critics. The apothecary is no different, neatly organized with rows upon rows of vibrant plant material housed in their glass apothecary jars perched on wood shelving. The Elderberry boasts its' own concoctions such as "Self Heal Skin Serum" and "Itchie Owie Everything Salve" to name a few, along with numerous other salves, creams, extracts and tea blends. Jan Wolfe, Nurse Practitioner, Certified Herbalist, mother, wife, and business owner welcomes people from all walks of life through The Elderberry's door and into their community apothecary and kitchen. Jan has been working with plants in some capacity her entire life, and is passionate about giving herbal medicine the spotlight it deserves with the brick and mortar apothecary. It is a place where the upbeat personalities of her and her knowledgeable staff shine to create a way for people to interact with the traditional medicines of our ancestors, bringing an uplifting comfort to clients and shop goers alike. The tea of the day on this particular visit is "Cool Change", a rich blend of Nettles, Peppermint, Marshmallow, and Shatavari. "This is the perfect tea for transitioning seasons, coming into warmer weather out of cold, dry winter. It's all at once moisturizing, soothing, nourishing, and warming." The power of herbal medicine is present here and it's in unique business models like this one where we find the power of people is present too. If The Elderberry doesn't already have what you're looking for made and waiting, custom crafting of herbal tea, tincture, powders, and oils are on the menu. Individual consultations are offered by Jan or Heather, the Apothecary Manager. The goal of the store is to bring the community together over a love for more holistic ways of living, for its members to achieve optimum health and homeostasis. This passion is translated into everything they do here, including teaching the community about herbal preparations. The educational classes and workshops offered at The Elderberry can be taken individually or in a series of classes depending on the depth of information students are striving for. Educational classes at The Elderberry offer opportunities for making herbal tea blends, extracts, oils, syrups, honeys, salves, lip balms, natural beauty products, aroma therapy, flower essences, how to make your own bone broth, and so much more. Don't adhere to classroom style learning? Try your hand at a monthly plant walk outdoors where participants learn to identify plants native to Virginia in all of their medicinal glory, a perfect marriage of southern charm, hospitality, and professionalism. The herbalist at The Elderberry know what they're talking about, and their tone shows they truly care about their cause. A cause, and a dream we here at SCORE are happy to have a small hand in manifesting. Jan Wolfe worked closely with SCORE to bring The Elderberry to life, acknowledging that a huge hurdle in starting the business was building a credible vision to selling medicinal herbs, admitting " People thought an apothecary just wasn't a viable business model. SCORE gave me sound advice, food for thought, validation, and encouragement. It was important for me to know I was on the right track" And here, two and a half years later, she is making it work. See for yourself on your next visit to Charlottesville. Whether you're curious about herbs, a practicing herbalist, or looking for new and natural ways of improving your health The Elderberry apothecary is sure to live up to their namesake of Community Herbs & Healing.